Categories: Aqua / Turquoise, Red. Create your very own time machine and take your guests back to the glamourous ‘50s with this super cute retro wedding invitation from Hip Hip Hooray! Inspired by the Motown music scene of the 1950s, the Rockabilly Retro wedding invitation is a must if you’re planning a wedding with a rock ‘n’ roll twist. Think juke boxes, American diners and the Pink Ladies; you can take a whole lot of inspiration from this design and inject it into every aspect of you wedding from start to finish! It goes without saying that this invitation probably isn’t the perfect match for the shy and retiring type, so if you’ve got a big bright personality you’ve certainly found a matching design! Reminiscent of the patterns often spotted (excuse the pun) on the fabrics of 1950’s skirts and dresses, the striking red and white polka dot border stands out vibrantly alongside your wedding details. 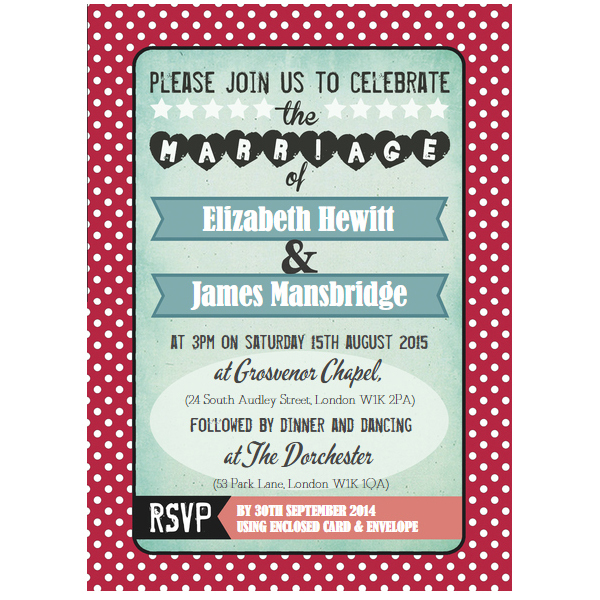 These have been printed on a vintage-style blue background in an array of eye catching typefaces; we particularly love the layout of the words ‘Please join us to celebrate the marriage of’ and the use of hearts and stars to add that all important showbiz feel. The Bride and Groom’s names are printed within two banners, taking centre-stage in the middle of the 126mm x 175mm postcard-style invitation. One thing is for sure – your guests will be expecting lots of retro fun at your wedding reception with these rockabilly invitations, so get those creative juices flowing, order a few Pink Lady jackets for the photo booth and create a truly unique day for everyone to remember for years to come! Tags: 1950s, Motown, Musical, Polka Dot, Retro, Rockabilly.